1 A None No Power Seat 1 A is a standard Business Premier Class seat, however, the proximity to the galley may be bothersome. There is no overhead bin directly above this seat. 1 B None No Power Seat 1 B is a standard Business Premier Class seat, however, the proximity to the galley may be bothersome. There is no overhead bin directly above this seat. 1 J None No Power Seat 1 J is a standard Business Premier Class seat, however, the proximity to the galley may be bothersome. There is no overhead bin directly above this seat. 1 K None No Power Seat 1 K is a standard Business Premier Class seat, however, the proximity to the galley may be bothersome. There is no overhead bin directly above this seat. 10 A None No Power Seat 10 A is a standard Business Premier Class seat. 10 B None No Power Seat 10 B is a standard Business Premier Class seat. 10 J None No Power Seat 10 J is a standard Business Premier Class seat. 10 K None No Power Seat 10 K is a standard Business Premier Class seat. 11 A None No Power Seat 11 A is a standard Business Premier Class seat. 11 B None No Power Seat 11 B is a standard Business Premier Class seat. 11 J None No Power Seat 11 J is a standard Business Premier Class seat. 11 K None No Power Seat 11 K is a standard Business Premier Class seat. 12 A None No Power Seat 12 A is a standard Business Premier Class seat. Passengers requiring a bassinet are often placed in the seats behind, which may be bothersome. 12 B None No Power Seat 12 B is a standard Business Premier Class seat. 12 J None No Power Seat 12 J is a standard Business Premier Class seat. 12 K None No Power Seat 12 K is a standard Business Premier Class seat. Passengers requiring a bassinet are often placed in the seats behind, which may be bothersome. 2 A None No Power Seat 2 A is a standard Business Premier Class seat. 2 B None No Power Seat 2 B is a standard Business Premier Class seat. 2 J None No Power Seat 2 J is a standard Business Premier Class seat. 2 K None No Power Seat 2 K is a standard Business Premier Class seat. 23 A None No Power Seat 23 A is a Premium Economy seat with additional legroom. There is no floor storage for this seat during takeoff and landing. The tray table and video monitor are in the armrest, making the armrest immovable and slightly reducing seat width. 23 B None No Power Seat 23 B is a Premium Economy seat with additional legroom. There is no floor storage for this seat during takeoff and landing. The tray table and video monitor are in the armrest, making the armrest immovable and slightly reducing seat width. 23 D None No Power Seat 23 D is a Premium Economy Class seat with additional legroom. Passengers with infants are often seated here as there is a bassinet, which may be bothersome. There is no floor storage for this seat during takeoff and landing. The tray table and video monitor are in the armrest, making the armrest immovable and slightly reducing seat width. 23 E None No Power Seat 23 E is a Premium Economy Class seat with additional legroom. Passengers with infants are often seated here as there is a bassinet, which may be bothersome. There is no floor storage for this seat during takeoff and landing. The tray table and video monitor are in the armrest, making the armrest immovable and slightly reducing seat width. 23 F None No Power Seat 23 F is a Premium Economy Class seat with additional legroom. Passengers with infants are often seated here as there is a bassinet, which may be bothersome. There is no floor storage for this seat during takeoff and landing. The tray table and video monitor are in the armrest, making the armrest immovable and slightly reducing seat width. 23 G None No Power Seat 23 G is a Premium Economy Class seat with additional legroom. Passengers with infants are often seated here as there is a bassinet, which may be bothersome. There is no floor storage for this seat during takeoff and landing. The tray table and video monitor are in the armrest, making the armrest immovable and slightly reducing seat width. 23 J None No Power Seat 23 J is a Premium Economy seat with additional legroom. There is no floor storage for this seat during takeoff and landing. The tray table and video monitor are in the armrest, making the armrest immovable and slightly reducing seat width. 23 K None No Power Seat 23 K is a Premium Economy seat with additional legroom. There is no floor storage for this seat during takeoff and landing. The tray table and video monitor are in the armrest, making the armrest immovable and slightly reducing seat width. 26 J None No Power Seat 26 J is a standard Premium Economy Class seat. 27 B None No Power Seat 27 B is a standard Premium Economy Class seat. 27 J None No Power Seat 27 J is a standard Premium Economy Class seat. 28 A None No Power Seat 28 A is a standard Premium Economy seat whose proximity to the lavatory and galley may be bothersome. 28 B None No Power Seat 28 B is a standard Premium Economy seat whose proximity to the lavatory and galley may be bothersome. 28 D None No Power Seat 28 D is a standard Premium Economy Class seat. 28 E None No Power Seat 28 E is a standard Premium Economy Class seat. 28 F None No Power Seat 28 F is a standard Premium Economy Class seat. 28 G None No Power Seat 28 G is a standard Premium Economy Class seat. 28 J None No Power Seat 28 J is a standard Premium Economy seat whose proximity to the lavatory and galley may be bothersome. 28 K None No Power Seat 28 K is a standard Premium Economy seat whose proximity to the lavatory and galley may be bothersome. 29 D None No Power Seat 29 D is a standard Premium Economy seat whose proximity to the lavatory and galley may be bothersome. 29 E None No Power Seat 29 E is a standard Premium Economy seat. 29 F None No Power Seat 29 F is a standard Premium Economy seat. 29 G None No Power Seat 29 G is a standard Premium Economy seat whose proximity to the lavatory and galley may be bothersome. 3 A None No Power Seat 3 A is a standard Business Premier Class seat. 3 B None No Power Seat 3 B is a standard Business Premier Class seat. 3 J None No Power Seat 3 J is a standard Business Premier Class seat. 3 K None No Power Seat 3 K is a standard Business Premier Class seat. 30 D None No Power Seat 30 D is a standard Premium Economy seat that is located between both lavatories and the proximity to the galley may be bothersome. 30 F None No Power Seat 30 F is a standard Premium Economy seat that is located between both lavatories and the proximity to the galley may be bothersome. 34 A None No Power Seat 34 A is a standard Economy Class seat. This seat has restricted legroom due to the protrusion of the exit door. It can get very cold by the exits during flight. The tray table is in the armrest, making the armrest immovable and slightly reducing seat width. There is no floor storage for this seat during take-off and landing. 34 B None No Power Seat 34 B is a standard Economy Class seat that has additional legroom, however, passengers with infants are often seated in this row as it is equipped with a bassinet. The tray table is in the armrest, making the armrest immovable and slightly reducing seat width. There is no floor storage for this seat during take-off and landing. 34 J None No Power Seat 34 J is a standard Economy Class seat that has additional legroom, however, passengers with infants are often seated in this row as it is equipped with a bassinet. The tray table is in the armrest, making the armrest immovable and slightly reducing seat width. There is no floor storage for this seat during take-off and landing. 34 K None No Power Seat 34 K is a standard Economy Class seat. This seat has restricted legroom due to the protrusion of the exit door. It can get very cold by the exits during flight. The tray table is in the armrest, making the armrest immovable and slightly reducing seat width. There is no floor storage for this seat during take-off and landing. 35 B None No Power Seat 35 B is a standard Economy Class seat, however, passengers with infants are often seated in this row as it is equipped with a bassinet. The proximity to the galley may be bothersome. 35 D None No Power Seat 35 D is a standard Economy Class seat, however, passengers with infants are often seated in this row as it is equipped with a bassinet. The proximity to the galley may be bothersome. The tray table is in the armrest, making the armrest immovable and slightly reducing seat width. There is no floor storage for this seat during take-off and landing. 35 E None No Power Seat 35 E is a standard Economy Class seat, however, passengers with infants are often seated in this row as it is equipped with a bassinet. The proximity to the galley may be bothersome. The tray table is in the armrest, making the armrest immovable and slightly reducing seat width. There is no floor storage for this seat during take-off and landing. 35 F None No Power Seat 35 F is a standard Economy Class seat, however, passengers with infants are often seated in this row as it is equipped with a bassinet. The proximity to the galley may be bothersome. The tray table is in the armrest, making the armrest immovable and slightly reducing seat width. There is no floor storage for this seat during take-off and landing. 35 G None No Power Seat 35 G is a standard Economy Class seat, however, passengers with infants are often seated in this row as it is equipped with a bassinet. The proximity to the galley may be bothersome. The tray table is in the armrest, making the armrest immovable and slightly reducing seat width. There is no floor storage for this seat during take-off and landing. 35 J None No Power Seat 35 J is a standard Economy Class seat, however, passengers with infants are often seated in this row as it is equipped with a bassinet. The proximity to the galley may be bothersome. 36 C None No Power Seat 36 C is a standard Economy Class seat that has additional legroom. There is no floor storage for this seat during takeoff and landing. The tray table and video monitor are in the armrest, making the armrest immovable and slightly reducing seat width. 36 H None No Power Seat 36 H is a standard Economy Class seat that has additional legroom. There is no floor storage for this seat during takeoff and landing. The tray table and video monitor are in the armrest, making the armrest immovable and slightly reducing seat width. 4 A None No Power Seat 4 A is a standard Business Premier Class seat. 4 B None No Power Seat 4 B is a standard Business Premier Class seat. 4 J None No Power Seat 4 J is a standard Business Premier Class seat. 4 K None No Power Seat 4 K is a standard Business Premier Class seat. 45 A None No Power Seat 45 A is a standard Economy Class seat which when purchased with the two adjacent seats may be converted to the Economy Skycouch. An extendable foot rest for all three seats is raised to create a couch-like seat providing a unique personal space with added comfort on long-haul flights. The seat pitch in this row is 33 inches. 45 B None No Power Seat 45 B is a standard Economy Class seat which when purchased with the two adjacent seats may be converted to the Economy Skycouch. An extendable foot rest for all three seats is raised to create a couch-like seat providing a unique personal space with added comfort on long-haul flights. The seat pitch in this row is 33 inches. 45 C None No Power Seat 45 C is a standard Economy Class seat which when purchased with the two adjacent seats may be converted to the Economy Skycouch. An extendable foot rest for all three seats is raised to create a couch-like seat providing a unique personal space with added comfort on long-haul flights. The seat pitch in this row is 33 inches. 45 H None No Power Seat 45 H is a standard Economy Class seat which when purchased with the two adjacent seats may be converted to the Economy Skycouch. An extendable foot rest for all three seats is raised to create a couch-like seat providing a unique personal space with added comfort on long-haul flights. The seat pitch in this row is 33 inches. 45 J None No Power Seat 45 J is a standard Economy Class seat which when purchased with the two adjacent seats may be converted to the Economy Skycouch. An extendable foot rest for all three seats is raised to create a couch-like seat providing a unique personal space with added comfort on long-haul flights. The seat pitch in this row is 33 inches. 45 K None No Power Seat 45 K is a standard Economy Class seat which when purchased with the two adjacent seats may be converted to the Economy Skycouch. An extendable foot rest for all three seats is raised to create a couch-like seat providing a unique personal space with added comfort on long-haul flights. The seat pitch in this row is 33 inches. 46 A None No Power Seat 46 A is a standard Economy Class seat which when purchased with the two adjacent seats may be converted to the Economy Skycouch. An extendable foot rest for all three seats is raised to create a couch-like seat providing a unique personal space with added comfort on long-haul flights. The seat pitch in this row is 33 inches. The proximity to the lavatory and galley may be bothersome. 46 B None No Power Seat 46 B is a standard Economy Class seat which when purchased with the two adjacent seats may be converted to the Economy Skycouch. An extendable foot rest for all three seats is raised to create a couch-like seat providing a unique personal space with added comfort on long-haul flights. The seat pitch in this row is 33 inches. The proximity to the lavatory and galley may be bothersome. 46 C None No Power Seat 46 C is a standard Economy Class seat which when purchased with the two adjacent seats may be converted to the Economy Skycouch. An extendable foot rest for all three seats is raised to create a couch-like seat providing a unique personal space with added comfort on long-haul flights. The seat pitch in this row is 33 inches. The proximity to the lavatory and galley may be bothersome. 46 D None No Power Seat 46 D is a standard Economy Class seat, however, the proximity to the lavatory and galley may be bothersome. 46 G None No Power Seat 46 G is a standard Economy Class seat, however, the proximity to the lavatory and galley may be bothersome. 46 H None No Power Seat 46 H is a standard Economy Class seat which when purchased with the two adjacent seats may be converted to the Economy Skycouch. An extendable foot rest for all three seats is raised to create a couch-like seat providing a unique personal space with added comfort on long-haul flights. The seat pitch in this row is 33 inches. The proximity to the lavatory and galley may be bothersome. 46 J None No Power Seat 46 J is a standard Economy Class seat which when purchased with the two adjacent seats may be converted to the Economy Skycouch. An extendable foot rest for all three seats is raised to create a couch-like seat providing a unique personal space with added comfort on long-haul flights. The seat pitch in this row is 33 inches. The proximity to the lavatory and galley may be bothersome. 46 K None No Power Seat 46 K is a standard Economy Class seat which when purchased with the two adjacent seats may be converted to the Economy Skycouch. An extendable foot rest for all three seats is raised to create a couch-like seat providing a unique personal space with added comfort on long-haul flights. The seat pitch in this row is 33 inches. The proximity to the lavatory and galley may be bothersome. 47 D None No Power Seat 47 D is a standard Economy Class seat that has limited recline. This seat is located between both lavatories and the proximity to the galley may be bothersome. 47 E None No Power Seat 47 E is a standard Economy Class seat that has limited recline. This seat is located between both lavatories and the proximity to the galley may be bothersome. 47 F None No Power Seat 47 F is a standard Economy Class seat that has limited recline. This seat is located between both lavatories and the proximity to the galley may be bothersome. 47 G None No Power Seat 47 G is a standard Economy Class seat that has limited recline. This seat is located between both lavatories and the proximity to the galley may be bothersome. 48 A None No Power Seat 48 A is a standard Economy Class seat that has extra legroom, however, the Exit Door protrusion and the proximity to the galley may be bothersome. The tray table and video monitor are in the armrest, making the armrest immovable and slightly reducing the seat width. There is no floor storage for this seat during takeoff and landing. 48 B None No Power Seat 48 B is a standard Economy Class seat that has additional legroom. The proximity to the lavatories and galley may be bothersome. The tray table and video monitor are in the armrest, making the armrest immovable and slightly reducing the seat width. There is no floor storage for this seat during takeoff and landing. 48 C None No Power Seat 48 C is a standard Economy Class seat that has additional legroom. The tray table and video monitor are in the armrest, making the armrest immovable and slightly reducing the seat width. There is no floor storage for this seat during takeoff and landing. Passengers with infants are often seated in this row as it is equipped with a bassinet. The proximity to the lavatories and galley may be bothersome. 48 D None No Power Seat 48 D is a standard Economy Class seat that has additional legroom. The tray table and video monitor are in the armrest, making the armrest immovable and slightly reducing the seat width. There is no floor storage for this seat during takeoff and landing. Passengers with infants are often seated in this row as it is equipped with a bassinet. The proximity to the lavatories and galley may be bothersome. 48 E None No Power Seat 48 E is a standard Economy Class seat that has additional legroom. The tray table and video monitor are in the armrest, making the armrest immovable and slightly reducing the seat width. There is no floor storage for this seat during takeoff and landing. Passengers with infants are often seated in this row as it is equipped with a bassinet. The proximity to the lavatories and galley may be bothersome. 48 F None No Power Seat 48 F is a standard Economy Class seat that has additional legroom. The tray table and video monitor are in the armrest, making the armrest immovable and slightly reducing the seat width. There is no floor storage for this seat during takeoff and landing. Passengers with infants are often seated in this row as it is equipped with a bassinet. The proximity to the lavatories and galley may be bothersome. 48 G None No Power Seat 48 G is a standard Economy Class seat that has additional legroom. The tray table and video monitor are in the armrest, making the armrest immovable and slightly reducing the seat width. There is no floor storage for this seat during takeoff and landing. Passengers with infants are often seated in this row as it is equipped with a bassinet. The proximity to the lavatories and galley may be bothersome. 48 H None No Power Seat 48 H is a standard Economy Class seat that has additional legroom. The tray table and video monitor are in the armrest, making the armrest immovable and slightly reducing the seat width. There is no floor storage for this seat during takeoff and landing. Passengers with infants are often seated in this row as it is equipped with a bassinet. The proximity to the lavatories and galley may be bothersome. 48 J None No Power Seat 48 J is a standard Economy Class seat that has additional legroom. The tray table and video monitor are in the armrest, making the armrest immovable and slightly reducing the seat width. There is no floor storage for this seat during takeoff and landing. Passengers with infants are often seated in this row as it is equipped with a bassinet. The proximity to the lavatories and galley may be bothersome. 48 K None No Power Seat 48 K is a standard Economy Class seat that has extra legroom, however, the Exit Door protrusion and the proximity to the galley may be bothersome. The tray table and video monitor are in the armrest, making the armrest immovable and slightly reducing the seat width. There is no floor storage for this seat during takeoff and landing. 5 A None No Power Seat 5 A is a standard Business Premier Class seat. 5 B None No Power Seat 5 B is a standard Business Premier Class seat. 5 J None No Power Seat 5 J is a standard Business Premier Class seat. 5 K None No Power Seat 5 K is a standard Business Premier Class seat. 56 C None No Power Seat 56 C is a standard Economy Class seat that juts out into the aisle and is bumped into by other passengers and crew. 56 H None No Power Seat 56 H is a standard Economy Class seat that juts out into the aisle and is bumped into by other passengers and crew. 59 A None No Power Seat 59 A is a standard Economy Class seat in the last row of the aircraft and may have limited or no recline. Proximity to the galley and lavatory may be bothersome. 59 B None No Power Seat 59 B is a standard Economy Class seat in the last row of the aircraft and may have limited or no recline. Proximity to the galley and lavatory may be bothersome. 59 D None No Power Seat 59 D is a standard Economy Class seat, however, the proximity to the lavatory and galley may be bothersome. 59 G None No Power Seat 59 G is a standard Economy Class seat, however, the proximity to the lavatory and galley may be bothersome. 59 J None No Power Seat 59 J is a standard Economy Class seat in the last row of the aircraft and may have limited or no recline. Proximity to the galley and lavatory may be bothersome. 59 K None No Power Seat 59 K is a standard Economy Class seat in the last row of the aircraft and may have limited or no recline. Proximity to the galley and lavatory may be bothersome. 6 A None No Power Seat 6 A is a standard Business Premier Class seat. 6 B None No Power Seat 6 B is a standard Business Premier Class seat. 6 J None No Power Seat 6 J is a standard Business Premier Class seat. 6 K None No Power Seat 6 K is a standard Business Premier Class seat. 60 D None No Power Seat 60 D is a standard Economy Class seat in the last row of the aircraft and may have limited or no recline. Proximity to the galley and lavatory may be bothersome. 60 E None No Power Seat 60 E is a standard Economy Class seat in the last row of the aircraft and may have limited or no recline. Proximity to the galley and lavatory may be bothersome. 60 F None No Power Seat 60 F is a standard Economy Class seat in the last row of the aircraft and may have limited or no recline. Proximity to the galley and lavatory may be bothersome. 60 G None No Power Seat 60 G is a standard Economy Class seat in the last row of the aircraft and may have limited or no recline. Proximity to the galley and lavatory may be bothersome. 7 A None No Power Seat 7 A is a standard Business Premier Class seat, however, the proximity to the lavatories and galley may be bothersome. 7 B None No Power Seat 7 B is a standard Business Premier Class seat, however, the proximity to the lavatories and galley may be bothersome. 7 J None No Power Seat 7 J is a standard Business Premier Class seat, however, the proximity to the lavatories and galley may be bothersome. 7 K None No Power Seat 7 K is a standard Business Premier Class seat, however, the proximity to the lavatories and galley may be bothersome. 9 A None No Power Seat 9 A is a standard Business Premier Class seat, however, the proximity to the lavatory and galley may be bothersome. 9 B None No Power Seat 9 B is a standard Business Premier Class seat that faces into the lavatory. The proximity to the galley may be bothersome. 9 J None No Power Seat 9 J is a standard Business Premier Class seat that faces into the lavatory. The proximity to the galley may be bothersome. 9 K None No Power Seat 9 K is a standard Business Premier Class seat, however, the proximity to the lavatory and galley may be bothersome. This aircraft features OnDemand audio at every seat including 454 audio CD's and 18 radio shows. 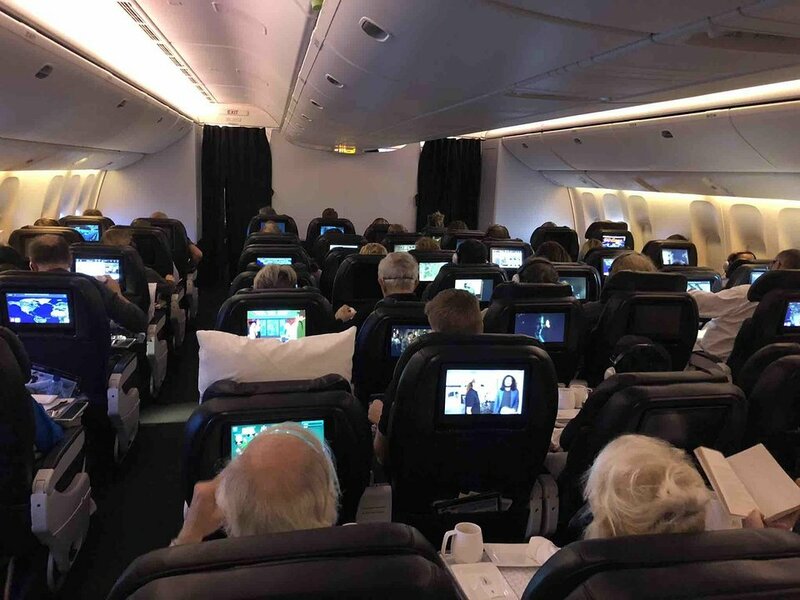 Each seat features a personal video screen and OnDemand video including 72 Movies, 881 Television Shows and 21 games. There are AC power, USB ports, and iPod docking capabilities at every seat. This 777-300 series plane features Air New Zealand's revolutionary new Skycouch for some Economy Class seats, new Premium Economy SpaceSeat and an improved Business Premier seat and service. The fact that this is a two-seat row is nice, with plenty of space to get up without blocking the aisle. However, there is no space to store a bag under the seat in front of you and stretching your legs out is awkward due to the placement of the supports for the row of seats in front (row 56). 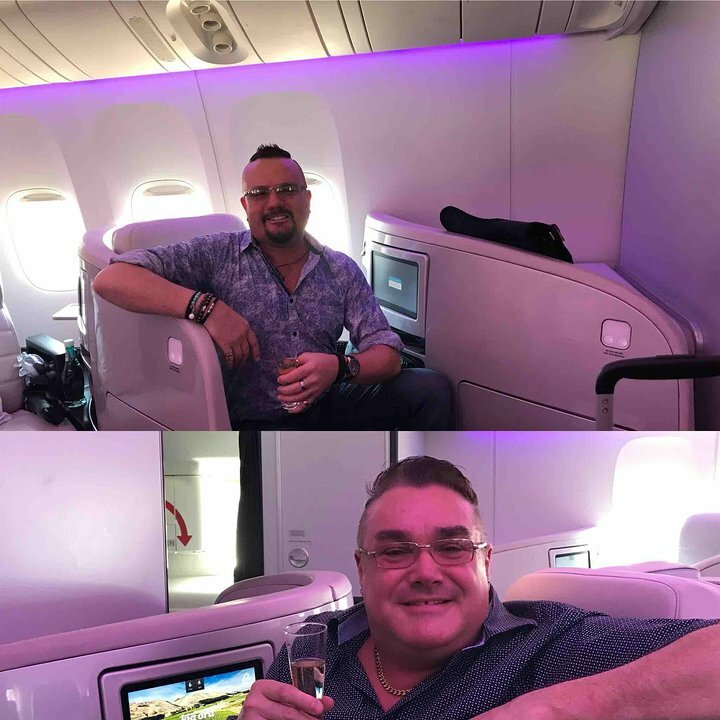 Having booked seats 1J and 1K all the way to Auckland I was starting to get worried by other reviews and the general SeatGuru view that these were not good seats. However, in my opinion they are great seats - the best in BC. The proximity to the galley and the WCs is not 'bothersome' at all, the WC is nowhere near these seats and people don't congregate in this area. There is no noise from the galley and being served first was nice. We flew back in row 5 and I would have changed to row 1 if I could. Having a lie-flat bed makes all the difference on an overnight long haul flight like this, and in my mind that's what you're paying for; all the other stuff is basically fluff. The Air New Zealand Business Premier seats might have seemed state of the art about 15 years ago, but the conversion from seat to flat bed and back is a bit awkward. It CAN be done by the passenger, but it will be faster and more efficient when done by the FAs. I figured it out on my own, but users who are used to pressing a button to go back and forth may find this process frustrating. The mattress, comforter and pillow are really quite comfortable once set up. The alignment of the seats does not facilitate conversation with any of your neighbors. My wife and I were across the aisle from each other but resorted to the infotainment system's text message app to communicate. The food was plentiful but unremarkable...poached eggs for breakfast were the highlight. Drinks, on the other hand, were great, with a selection of NZ wines onboard and I was happy with the single malt scotch on offer. Service on this flight was uniformly excellent from the Auckland based cabin crew. They were highly attentive and everyone always had a smile on their face. They were also quiet during quiet time, which is greatly appreciated on a red eye flight. Worst Bus Class seat ever! The only way to get to the lie-flat position is to have the flight attendant put it in that position and put a mattress pad down. To get out of the lie flat position you have to have the flight attendant take it out of the lie flat position. So if you are in bad weather and the attendants cannot get up you are stuck in the lie-flat position!! Also, the seating arrangement for couples is bad. The 2 middle seats have a high immovable divider between them and face away from each other. The Business class, in general, was average. Food was nothing special. I sat in this seat ACK>HNL and back again a week later. Unfortunately this aircraft is the EVA Air "dry leased" replacement plane due to the servicing of RR Trent engines. It is obviously an early version of 777-300 as it made many noises in take of and landing that indicate it is of some age. The inclusion of Chinese subtitles on movies etc was a bit annoying, certainly IFE less interesting than on normal Air NZ craft. The NZ crew on the flight up to HNL did a magnificent job in servicing the clients as it was their first flight on this aircraft, food was great and they always managed a smile. On the way back, same aircraft but a more experienced crew on this aircraft, food was excellent as was the service. Two staff membranes even went around shaking hands with each client at the end of the flight wishing everyone a pleasant stay in NZ. unheard of service, simply marvellous. There is actually a bullhead in front of the exit so even they sell it as XL seat you cant stretch your legs! Great seat. The only downside is that overhead storage is somewhat limited. I was lucky in that I was able to use the overhead bind across the aisle since the seats were empty. Avoid this row of seats at all costs! Unfortunately, I had a late booking and my seating choices were non-existent. The location is probably one of the worst, especially with the seemingly non-stop line of people utilizing the lavatory. It's almost impossible to get any sleep and people are bumping into you constantly. A definitely miserable experience. This is a preferred seat in Premium Economy. Overall I was pleased with this seat. Service and food was good. Leg room almost perfect. I am approx 1.8m tall and wished for a few more inches of leg room. I found the fold out foot rest difficult to operate and not very comfortable.The TV screen and tray table pull out of the seat. I got a chance to try out the skycouch as I had no other passengers in my row. I'm 6'1" tall. The flight attendant had told me to put my head at the bulkhead side to avoid being bumped but that means there is nothing to put your feet against and eventually as I went to sleep my feet would extend into the aisle and that does not work for long. 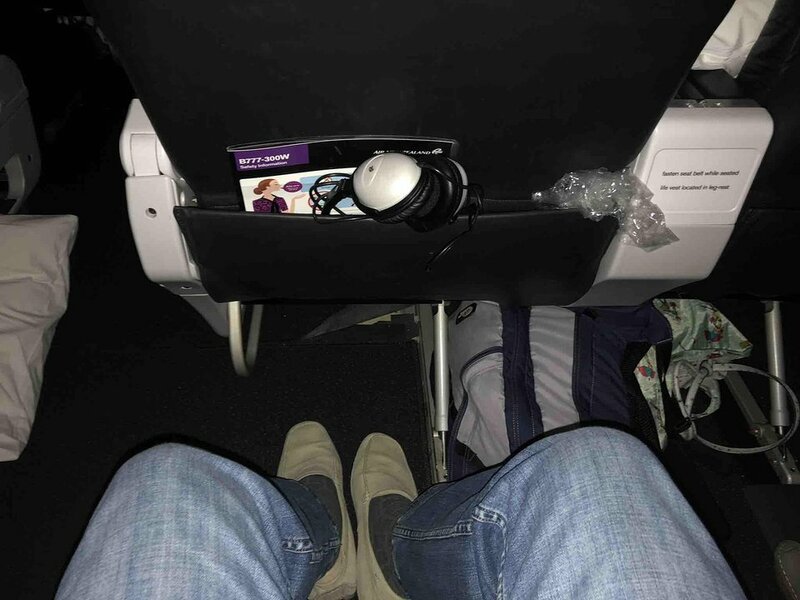 Eventually I moved my head to the aisle side with plenty of pillows against the armrest and then folded my knees and pressed my feet against the bulkhead - that worked much better. I think the skycouch is a cool idea and it was great to try it out at no extra cost (thanks Air NZ). Smaller people and families would find it good. For me I think I sleep just as well in the regular seat. Air NZ economy is super comfortable as airlines go theese days. As a regular long haul traveler I'm impressed with all the effort that Air NZ has gone to over the years to improve passenger comfort. I usually sleep quite well on long haul with a window seat and have sufficient room for quite reasonable comfort. The food on my last flight was outstanding. While this seat does indeed have plenty of leg room, it is also directly in the path of traffic. My husband sat here on LHR-LAX and was bumped by nearly every person walking by, got no sleep at all. People gathered in front of us the entire trip to use the toilet, and the flight crew did not close the curtain to the galley. Overall, service by ANZ staff was lackadaisical at best. This is not a business class seat. Way too small. Also no WIFI. Unheard of. This seat configuration definitely isn't set up for couples as the two middle seats face away from each other and have an immovable barrier between them. We took one middle and one window which was still somewhat difficult, as all seats angle out and staggered so the only way we really talked was sitting together at meals (which was nice) and over the online chat through the entertainment system. Still, I was quite pleased with the seat; it was very comfortable and I didn't find the lack of recline bothersome at all. It was enough for me. The FA were very attentive and made up the bed cheerily and quickly. This is the most comfortable bed I've had in Business - plenty of room for me (I'm only 5'4"), two nice firm pillows, the mattress pad is at least an inch or two thick and a purple comforter which you don't really need. I had no trouble getting in our out of the bed. Contrary to my trepidation being so close to the front galley, there was no noise that disturbed me at all. The food was disappointing. After reading accolades, I ordered the beef cheeks and could barely saw through the piece it was so tough. I wasn't a fan of the desserts either, but ice cream and panna cotta just aren't my preference. The service and bed were outstanding, as were the entertainment selections. Improvement on food would be excellent. And perhaps a nicer amenity kit. The middle seats E and F have the seat mounts in the middle which makes legroom very awkward. This is the case throughout the economy cabin because the 4 seat banks still use the mounts for the 3 seat banks for which this cabin was designed. Seat was comfortable, supportive and easy to operate. Personal storage was poor, with nowhere to out the water bottle, but at least there was under-storage beneath the legrest. Movie and tv selection was good, and easily operated. My main complaint was about the orientation of the seats, which faced inwards towards the aisle. This gave everyone a view of other passengers feet (highly offensive in some cultures) and required you to look backwards over your shoulder to See out of the window. Business class seats are a terrible design. You either sit up with limited recline or you have the seat converted to a flat bed which does not adjust. If you want to sit up you must have the bed converted back to the seat configuration. This is good if you want to get on and sleep for the entire flight, but very inconvenient if you want to change between sitting up and lying flat. Very difficult to get out of the bed configuration, watched a number of people struggle with that. On the positive side, food and wine choices were very good. This is a great economy seat. It is a little narrower than the normal economy seat. But the added leg room more than makes up for it. The galley and lavatory are not an issue. I flew LAX->LHR->LAX in this seat. There was not the usual gaggling of people waiting for the lavatory. I'm 6'6" and need the added leg room. There is no bulkhead in front of this seat. There is a bulkhead in front of the A and B seats in this row. But there is still more legroom for those seats. Air New Zealand flight crews were great. They were very attentive and made lots of laps serving water and other drinks. 29D is marked with a warning for proximity to the toilet - but it should be noted the toilet/galley area is curtained off from the economy section, the the only people "queing up" for the bathroom is from the Prem Eco section, so rarely a problem. Row 30 (30E, 30F) is definitely last resort. Also found 28J to be better as there is a locker between the seat back and toilet (locker not shown on the seat map). Nice leather seat with plenty of leg room and ability to recline to a comfortable position with leg and foot rests making a comfortable flight. Bathrooms are behind the premium economy seats and are reserved for premium economy passengers only so there are no queues. Premium economy seat. Centre aisle. Adjustable headrest with adjustable supporting winglets. Extending leg and foot rests. Good pitch and recline adjustment. Power and USB sockets, plus Airline headset socket. Seatback entertainment system. A very good seat. I was assigned seat 28B (premium economy) as part of an accepted OneUp bid (US$405) on NZ008 from AKL to LAX. Premium economy on AirNZ is a great product and the seats are similar to (if not better than) domestic first class. Only downside to this seat was proximity to bathroom. You can hear (feel?) the toilet flush, even with ear plugs, and this woke me up a few times (though I never sleep soundly on planes). You can also hear conversations of people gathering nearby to stretch their legs or wait to use the bathroom. On the upside, the bathroom is close by and you can easily get up when it becomes available and not have to wait. This bathroom is also HUGE by plane standards (I think it is accessible). I also liked not having anyone sitting behind me to knock my seat as they are trying to get out. When these seats are reclined, it takes a bit of acrobatics to get out and it is hard not to support yourself on the chair in front of you. One last thing to consider: you will likely be served last in this row for the first meal and may not get your choice of food (I did not get my first choice). However, on the second meal, the flight attendants start from this row and work their way forward. Air New Zealand flies 1 versions of Boeing 777-300.